The Capped Bust Quarter coins were minted between 1815 and 1838. 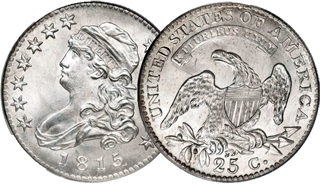 They are most likely called “capped bust” because the bust on the obverse or front of the quarter has a cap on its head with the word Liberty written on it. These Bust quarter coins were eventually replaced by the Liberty Seated Quarters in 1838.